Identity/Class: Unknown - Human mutate or mutant? Powers/Abilities: Forge can control machinery, altering it's function at will. She generally creates skin-tight armour, arms herself with a big gun, and a surfboard-like flying board. History: Forge was a young girl able to control machinery. She fashioned herself as a superhero, and allied herself with fellow superhumans, Niteside and the Rock. For five years they helped humanity, without ever encountering a genuine supervillain. That changed when Professor Heisenburg showed up, kidnapping Forge and threatening the lives of an entire town, Mount Yabba. Niteside and Rock managed to save their ally, but Mount Yabba and its thousands of citizens died. Rock and Forge were devastated by this, but Niteside seemed unbothered. Forge and the Rock both retired and dropped out of sight of the public, but Niteside continued to operate openly, with her power growing constantly. For nearly twenty five more years Niteside grew increasingly powerful and increasingly inhuman and callous. Finally in 2028 she went on a public rampage, slaughtering the few remaining superheroes and anyone else who crossed her path. Forge came out of retirement to face her, and tried to convince Rock to do the same. 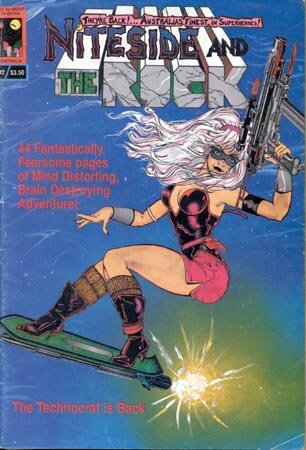 While she faced off against Niteside, who by this time had slaughtered several major cities, Rock used an invention of Forge's to travel back to 1984 to kill Niteside after she gained her powers, but before she became too powerful or corrupted. Unfortunately, while the Rock was in the past, Niteside caught up with her former ally, and brutally murdered her.